This raises more concerns about the stated bus performance levels in the TransLink Annual Report. I just don't believe them at all. Brisbane commuters are spending significantly longer periods in their cars than they should be because of continued peak-hour congestion, the latest Travel Times report confirms. Traffic on almost all of the city’s major routes slows to less than 35km/h – lower than the school zone limit - during the morning and evening peak periods, the survey by RACQ, the state’s peak motoring body, says. At the worst spots, traffic moves less than 20km/h and one kilometre takes more than three minutes to travel. The situation has worsened for most outbound routes since the last review in 2007, but the average inbound trip has improved. Twenty of 24 comparable routes showed a decline in average speeds since 1993. Round trips on four major arterial roads – Gympie, Logan and Old Cleveland roads and Centenary Highway – take more than seven minutes longer in 2010 than they did in 2004, at 78 minutes, according to RACQ. The survey has been conducted every three or four years since 1993 to compare the city’s congestion levels and identify the biggest trouble spots. This year’s travel times were recorded during May and June and take in the city’s busiest 17 routes: the Pacific Motorway (old South East Freeway), Wynnum Road, Centenary Highway, Old Cleveland Road, Logan Road, Gympie Road, Beaudesert Road, Samford Road, Sandgate Road, Moggill Road, Old Northern Road, Waterworks Road, Kingsford Smith Drive, Ipswich Motorway, Gateway Motorway, Brisbane Urban Corridor and Metroad 5. Travelling into the city during 7-9am, was slowest on Old Northern Road, which dissects the city’s northern suburbs, and Moggill Road in the south-west, with average speeds of just 18.7km/h and 19.3km/h, respectively. Old Northern Road is even worse along the 4 kilometre stretch from Dargie Street to Samford Road, where drivers moved on average 12.8km/h, taking 19 minutes to complete. Outbound traffic in the evening peak period of 4-6pm was slowest on Sandgate Road at an average speed of 18.4 km/h. The recently opened and now troubled Clem7 tunnel provided mixed results for surface roads directly above the tunnel and near entry and exit portals. In particular, the section of Bowen Bridge Road between Gregory Terrace and the Clem7 exit outbound takes on average more than double the time compared to 2007. The Story Bridge and Shafston Avenue, which were supposed to improve following the tunnel’s March debut, also generally slowed, according to the survey. The new Metroad 5, running north-south west of the CBD, was added to the survey this year. The route from Everton Park to Toowong recorded an average speed of 19.3 km/h for the southbound morning run. RACQ says the slow pace proved the incomplete western bypass was causing problems. Wednesday is the worst day for inbound peak-hour commuters, while Thursday proved the worst for outbound journeys. Mondays and Fridays are generally the best days. Bus ontime performance is a window 2 minutes early 6 minutes late. Train 3.59 minutes. Misleading to directly compare to two as different performance standards. In 2009–10 bus on-time running and services delivered performed better than benchmarks, with 99.99 per cent of services running without cancellation and 95.01 per cent of all bus services running on time. This represents a 3.1 per cent improvement on 2008–09 levels. Since the introduction of on-time running measurement, TransLink bus operator performance has been gradually improving and continues to do so, despite the increasing effects of growing traffic congestion on South East Queensland’s roads. Increased use of go card on services are contributing to reductions in boarding times and stop dwell times, saving around 3 000 hours a week in reduced bus boarding times. As go card usage continues to increase and additional pre-paid bus services are rolled out, these time savings will result in even faster, more reliable bus services. With respect to ontime performance, 1 in 20 buses is officially late. Is that acceptable? My own feedback suggests the public's perception of bus ontime performance is about 80%, better on the SE Busway. A constant issue raised is 'no shows'. These may be lost buses at times but more than likely are just services pulled for other priorities, driver sickeness, crew hours etc. etc. I meant what was the peak hour speed? No idea, nothing on the RACQ web site either that I could find. After 40 years the RACQ is still in denial. All the road infrastructure they have lobbied for had created the problems not failed to fix them. Trouts Road Rail can't come soon enough! Temporary bus lanes during peak hour would also help. The road is actually quite good for Light Rail too..
draft media release under way. Will post soon. Where on earth is that? Is that photo real? RAIL Back On Track (http://backontrack.org) a web based community support group for rail and public transport and an advocate for public transport commuters has called for an urgent paradigm shift in transport planning in SEQ transport with the release of the RACQ's latest Travel Times survey showing traffic on almost all of the city’s major routes slows to less than 35km/h during the morning and evening peak periods. * the recent Independent Public Inquiry into Sydney's Long Term Public Transport Plan also found that increasing levels of congestion cannot be overcome by relying on further decentralisation and endless road building." "It is time for our Governments and the RACQ to accept that today's traffic congestion is actually the result of the road infrastructure built over the last 40 years and not because of the latest missing link, no western bypass or not enough upgrades. Claiming more roads will reduce congestion is like smoking more cigarettes expecting it to cure lung cancer. The only outcome of building more freeways and tunnels is worse congestion and slower traffic speeds." "The Draft Connecting SEQ 2031 plan still remains too road centric and will continue to encourage more motor vehicle use whilst draining even more taxes away from vital services such as health, schools and policing. The fundamental reason why the current mode share of public transport does not match the 1997 projections of 10.5% (actual 7%) is due to the road centric infrastructure program over the last 10-15 years and the absolute failure to improve the frequency of both bus and particularly rail, and a failure to give buses a proper priority over other motor vehicles." 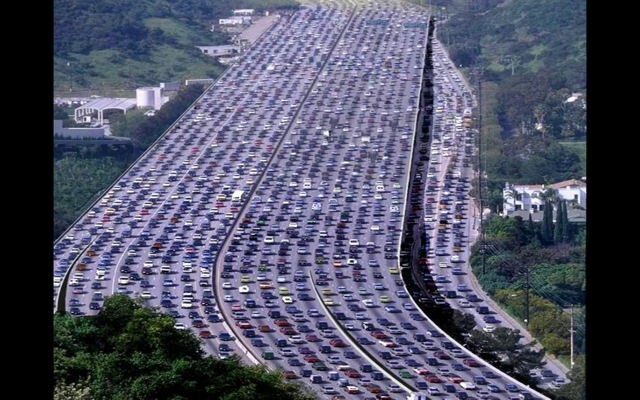 "More roads means more congestion. Pure and simple." It says that thousands of vehicles needlessly come into or near the city because no ring-road existed. "We need to keep road construction going or we're just going to go down, down, down," RACQ senior traffic engineer Greg Miszkowycz said. The RACQ is like those developers who scream at the government to release more land for housing in order to make houses more affordable; then socialise the cost of sewers and other infrastructure to existing ratepayers, while charging the max market rate for whatever they build on the land. What's needed is a way to stagger the peak traffic period. Maybe it is time for a congestion tax similar to that operating in London, with proceeds going to public transport initiatives. The technology exists to have a staggered tax throughout the day -- free before 6.30am, 50 per cent between 6.30am and 7am, 100 per cent between 7am and 9am, 80 per cent betwen 9am and 10am, 40 per cent through the day, ramping up again for the evening peak. Couple that with better park-n-ride facilities. Or would a carbon tax, with resulting higher fuel prices, tip the scales in drivers' minds (or hip-pocket) to move people to buses and trains. The present Queensland Government is not supportive of congestion taxes. This doesn't mean more enlightened views may prevail in the longer term though. These congestion points are where public transport in exclusive lanes have a large and direct advantage. Trouts Road Rail cannot come soon enough. Many of these roads have wide medians suitable for light rail or were former tram routes. Public transport- the original road capacity upgrade!!! The technology exists to have a staggered tax throughout the day -- free before 6.30am, 50 per cent between 6.30am and 7am, 100 per cent between 7am and 9am, 80 per cent betwen 9am and 10am, 40 per cent through the day, ramping up again for the evening peak. Couple that with better park-n-ride facilities. Or would a carbon tax, with resulting higher fuel prices, tip the scales in drivers' minds (or hip-pocket) to move people to buses and trains. I can see why- toll tunnels have caused a lot of controversy. And these are just new road. Imagine what a hot potato it will be to toll a public road. There has only been one example of when the peak hour spread- and that is when the Riverside Expressway was shut down. People left work early or later and more trains were put on. The biggest shift was to rail, which indicates that it is actually the first preference people will go to if they use Public Transport if they absolutely have to. I'm not convinced that there is great advantage to spreading the peak. Lots of congestion on roads will ensure this anyway --people leave early or later, and there are benefits in everyone starting work at around the same time. The speed of public transport must be increased, as should the capacity. Express trains really must be express! The future is bleak without a radical rethink. It is enough to make you want to pack up and go live on Stradbroke Island.